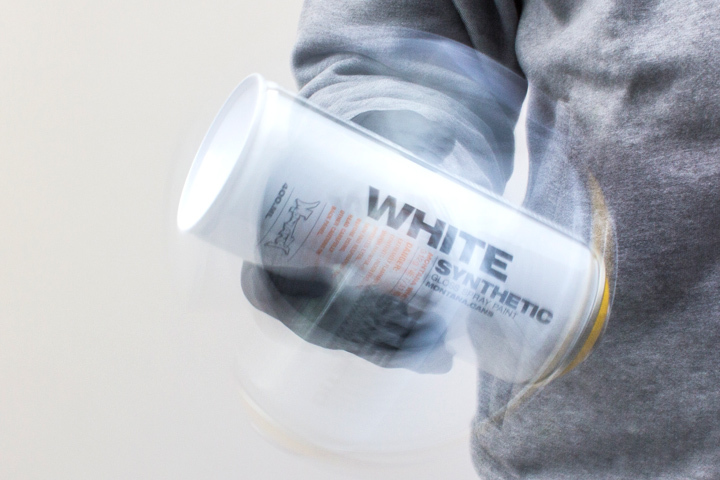 To reduce waste from packaging material, instead of a lid, Montana spray cans have a small black safety ring underneath the cap to prevent the can from being sprayed. To start using a Montana spray can it is necessary to remove the black safety ring under the nozzle first. There are a few Montana spray cans that do have a lid (such as ADHESIVE, DUSTCLEAN, GLITTER, GRANIT ) - these cans do not have a safety ring and therefore only the lid needs to be removed. Shake well: Montana products contain the highest quality ingredients and a high pigment load to guarantee an extraordinarily strong coverage. For optimum results, make sure to shake the can to mix the paint very well by using the technique shown here. For optimal lifespan, always make sure to store with the nozzle on the can. The safety ring is easy to remove - just lift up the nozzle and turn the spray can up side down and the ring will fall out. The ring helps to avoid accidental triggering in transport or storage. Turn the can upside down. Strike the bottom of the can against the palm of your other hand. Repeat this several times to make sure to loosen up the ball bearings* from the pigments in the can. Once the ball bearings* are loose, keeping the can turned upside down (advantage of gravity) and shake. Then shake the can vertically for at least 2 minutes. After you have shaked the can well put the nozzle back on the can. Fix carefully with your finger and make sure that it fits. Make sure to always do the first spray on a test surface first, as the top of the valve system may harbor more solvent than pigment on the first shot. This is normal. *The following products do not contain ball bearings: ACETONE, DUSTCLEAN, ADHESIVE SPRAY. Just shake the cans well for 2-3 minutes.